Yum! Another item on my Favorites list! I want to try this but think I'll wait until the heat is over, as I am not 100% sure how well fudge travels. 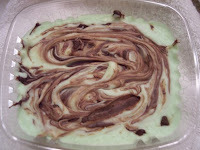 I love chocolate mint and I love fudge, so I am thinking I would surely enjoy this Chocolate Mint Fudge from Oh Fudge on Etsy. It looks delicious...I am imagining it cut up in squares so I can see all of the swirls and chips. It looks like mint chocolate chip ice cream, which reminds me that I have some in the freezer....off to get my sweet fix now!